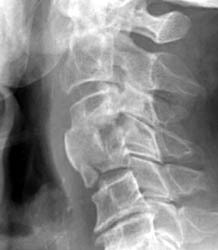 76 y.o male with symptoms of myelopathy, underwent C3,4 ACDF. 1 month later the patient had complaints of severe dysphagia, feelings of 'food and liquid getting caught'. This radiograph take 1 month later demonstrates anterior extrusion of bone graft material at C3-4 and an endplate fracture at C4. 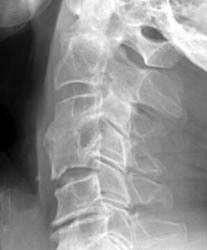 Conservative management utilizing a rigid cervical collar was prescribed for 6 months. 5 months later bony healing has occurred with incorporation of the graft.